Coventry City have signed Preston North End goalkeeper Jamie Jones in a 31-day emergency loan deal, with an option to extend it for a further two months. The 25-year-old Liverpudlian is expected to make his Sky Blues debut at Yeovil on Saturday. Jones joined North End last summer from Leyton Orient, where he had turned down the offer of a new contract. But after starting the season as number one at Deepdale, he lost his place in November. And he has since been relegated to third-choice by Preston's signing of Sam Johnstone from Manchester United until the end of the season. Ricoh Arena a lucky ground for Jones? Jamie Jones has already made two appearances at the Ricoh Arena, for Orient two seasons ago, and for Preston earlier this term, and is yet to concede a goal. He also played for Orient in their 3-1 defeat by Coventry at Sixfields last season. City boss Steven Pressley hopes that Jones can recapture the form he showed for Orient last season when they went close to promotion from League One. "We spoke about the goalkeepers that were available," Pressley told BBC Coventry & Warwickshire. "Jamie's name was at the top of our list and we've managed to move things along very quickly. "He has fantastic League One experience. 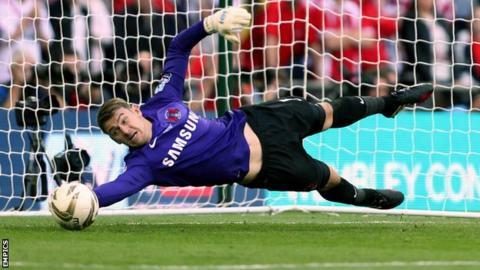 He was widely regarded as one of the best goalkeepers at this level last season during Leyton Orient's impressive year." Jones was part of Everton's academy before signing for Orient in 2008, and went on to make 179 appearances during his six years at Brisbane Road. Pressley's side, currently 18th in League One, have conceded six goals in their last two matches.